Under the scheme, the physical aids will be provided only to the senior citizens of the nation. This implies those who are aged above 60 years will get free assisted living aids and physical devices which are required for their sustainability. Also the govt. has selected the list of cities where the scheme will be implemented. The main criteria for the senior citizens to get full benefits of RVY scheme is that they must belong to BPL family and should hold valid BPL card issued by the concerned authority. All senior citizens who have a monthly income of Rs. 15,000 or less will be included in the Rashtriya Vayoshri Yojana. The physical aide and life assisting devices which will be provided to the eligible beneficiaries will be totally free of cost. In case an eligible beneficiary has multiple requirements/ needs, then multiple physical aids will be provided to that person under the scheme. This means if a senior citizen has hearing problem as well as is unable to walk, the hearing aid and walker will be provided to that person. The aids provided under the scheme will lessen the dependency of senior citizens on the other family members and they will become able to do their own tasks by overcoming their physical limitations. The govt. ahs also decided that the RVY scheme should at least cater the needs of all the women senior citizen and stated that 30 per cent of the total beneficiaries under the scheme should be women. Under the RVY scheme, the govt. will organize camps in order to register the beneficiaries and assign doctors for their check up, who will prescribe them life assisting devices. The main motto of the scheme RVY to be launched in the country is to empower the senior citizens of the nation. This scheme will provide them necessary physical aids which will be beneficial to carry on their day to day activities in a better way. The old ones have to depend on their family members for each and every task. 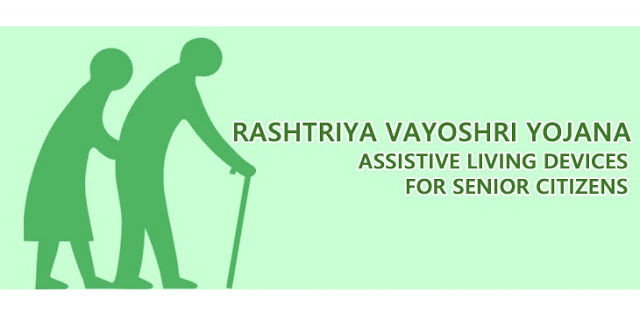 The RVY scheme will enable them to come out of their physical limitations and become self sufficient once again with the help of assisted – life devices which will be provided under the scheme. The RVY scheme is a central govt. funded scheme for the senior citizen of BPL category. To cater all needs of around 5.20 lakh eligible beneficiaries of the nation, a central agency named ALIMCO has been given the responsibility to look after the project implementation. The Dist. Collector or the Dist. Super will be responsible for screening of beneficiaries who need the scheme. This scheme will have its implementation by the end of 2019 – 20 as this is a three year scheme. The budget allocated for the scheme is Rs. 483.6 crore by the central govt. The RVY scheme is a welcome initiative and first of a kind by the central govt. in India to help out the senior citizen, specially from the BPL category by providing them medical aids, free of cost. The scheme is expected to benefit more than 5.20 lakh beneficiaries pan India, including Chennai and Kanya Kumari. This scheme will help those citizens who had to depend on their family members and could not do their daily physical activities. Apart from development of the entire nation, Modi government keeps an eye towards taking care of the needs of people, belonging to all sections. The Naveen Vayoshri Yojana is one such scheme that is aimed to assist senior citizens with physical aids. Formally the scheme has been implemented in Bikaner and Jhalawar, with the assistance of Rajasthan state government. Rajasthan government is going to implement it in Jaipur next. Respective department heads will hold a meeting with Arun Chaturvedi who is the social welfare minister this Friday. Once the scheme implementation gets a green signal from Chaturvedi, senior citizens in Jaipur will receive assisted-living devices and physical aids, sponsored by the state government. The beneficiaries of this scheme must be residents of Rajasthan. They must belong to the senior citizen age group. The project will offer these gears to those senior citizens who fall under the poverty line. These people will receive elbow crutches, walking sticks, hearing aids, walkers, tripods, spectacles and artificial dentures without paying any money. Apart from offering providing these aids, a PSU will be given the duty of maintaining these aids for one year. This maintenance work will also be done free of cost. This scheme is very helpful if produced clearly. But many citizens of below poverty line will not get this scheme so easily,they tend to pay some money in the form of illegal govt charge. Its been always followed by govt employees; Anyhow, when this will take birth in Bidar dist. ?